As much as I love my kitchen makeover, I think I love my dining room even more. The fabric combination is one of my favorites and based on your comments you like the happy look of it, too. The word joyful seems to sum it up just about perfectly. This room just makes me smile...and eat. Which may or may not be a good thing. 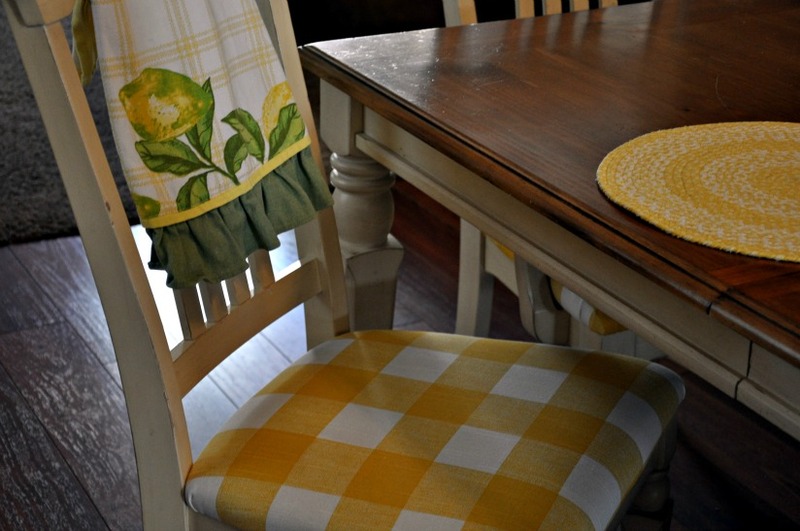 I am in love with the sunflower yellow valance and buffalo check chairs. I have been tempted to paint this oak hutch from the 90's on more than one occasion but have resisted and now I am glad I never followed through. 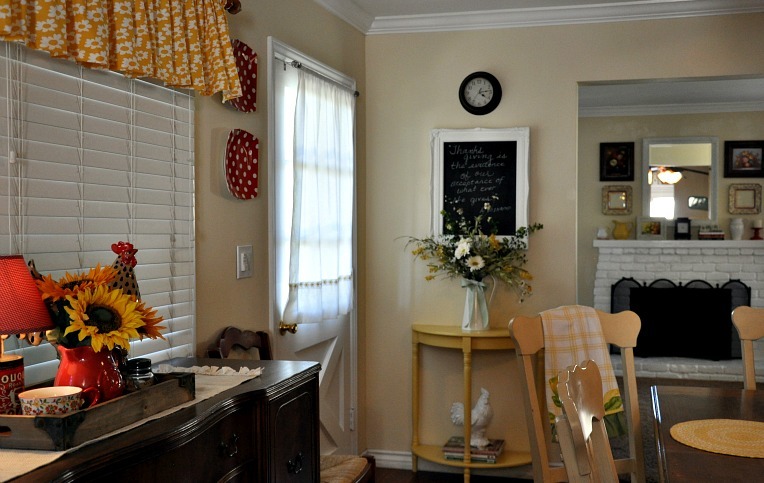 It really fits in with the farmhouse, mismatched style I have come to love. The 1940's sideboard was a gift for my 40th birthday from my husband. 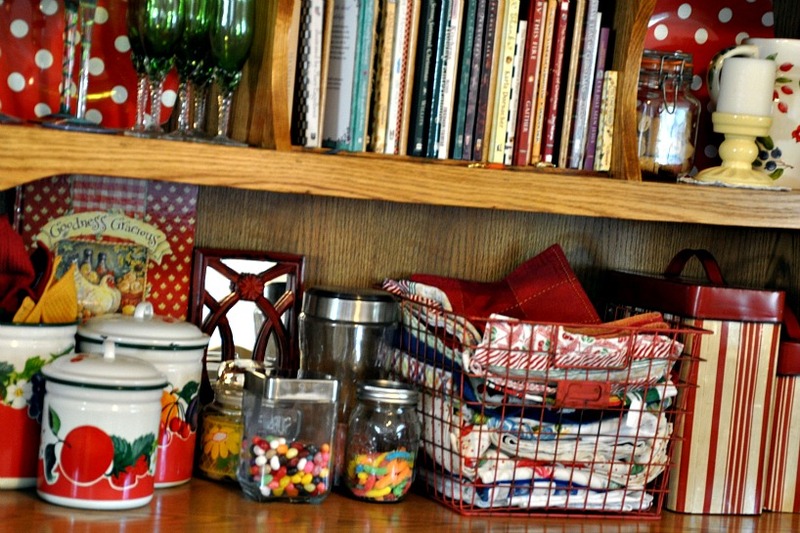 It holds all my teacups, teapots and dining room linens. I made the white burlap runner and love the simple uncluttered look of it paired with the more rustic wooden tray. The kitchen and dining room open to the living room which makes it important for the three rooms to work together as far as color and style go. My plan is to move into the living room next. I have zero budget for purchases with the exception of a gallon of touch up paint so my creativity will definitely be put to the test. I covered two of the newly upholstered yellow and white checked chairs with a layer of heavy plastic to grandchild proof them. My husband teases that maybe I should do the sofa's, too. Anyone else having a bad grandma flashback? I have a thing for pretty glassware and store most of it in this hutch. If I don't see, I won't use it so having it out in the open not only makes me smile but reminds to enjoy it as well. Our place mats are stored in this wire basket which makes it easy for everyone to remember to grab a clean one before sitting at the table to eat. The candy station, which is a staple here, is running low. I need to add it to my shopping list before the grands take notice. I store my household tools in the striped tin box, that way when I need the hammer, a screw driver or a nail they are right at hand. The round canisters store my tea light candles and my scented candle tarts. Behind the black checked curtain I have extra cake plates and serving dishes stored. The oak wine cabinet has moved with us a couple of times. I have almost given it away on more than one occasion but it still serves it's purpose. It is one piece that I definitely plan on painting some day. I think the transition from the dining room to the kitchen works well. 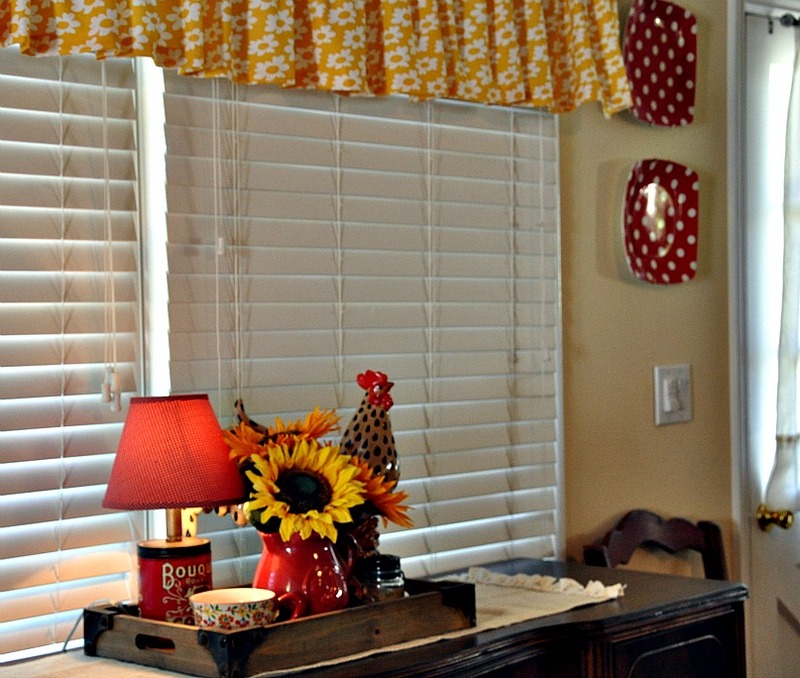 I love the mix of color and pattern in the valances and the casual, comfortable style of the rooms. I am still on the look out for a couple of thrifted or garage sale bar stools and like any room there are still little things that need tweaking but that's part of the fun, isn't it? Just lovely. What a fun place to cook and relax! I absolutely love it! It is so happy & cheerful & there are so many pretty things to look at! Your Home is so cozy and Welcoming! Your pictures are so clear and make me feel like I am actually in your Home. Wish I were there enjoying a cup of coffee with you and chatting a bit. I love all of your color mixes, everything works so well together. 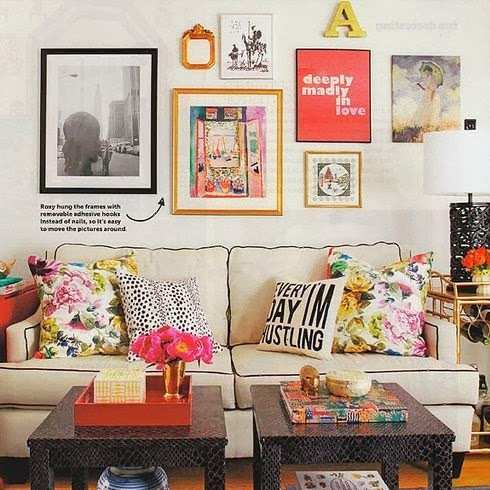 You have a great eye for decorating for sure! Thanks for sharing your Home with us! It looks so cheerful! I love all of your colors. Red being my favorite with yellow following close behind. on the chairs..... just redid mine last May in a yellow French provencal pattern. Wish I saw your first! Patty, I can see why you love it!! I just love all your color...it is definitely happy. I also love that you have not painted the hutch. I was just thinking about maybe putting a "skirt" on my china cabinet that has no doors yet. I love how yours looks. Beautiful rooms. Love all the color you've used. Everything looks so cozy and welcoming. Great job! 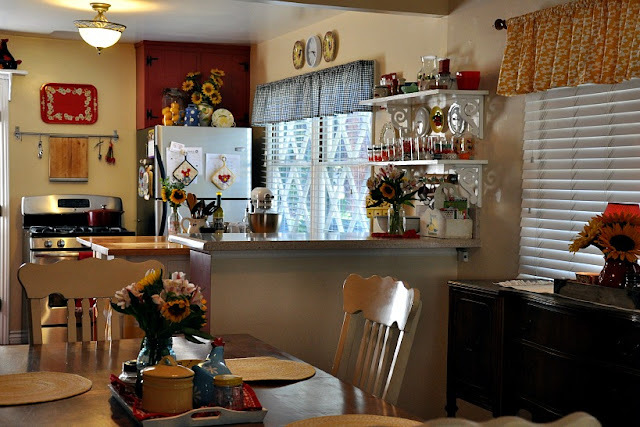 Soooooo lovely and cuzy, beautiful kitchen and your dining room! The fabric worked fantastic together! It makes you want to grab a chair and sit down and gab the day away! I purchase a new old dinning room set and when I got it home I don't like it, ugh! Yours would fit perfect in my house! I'll be right over to pick it up, LOL! Yes, your dinning room is a happy place! 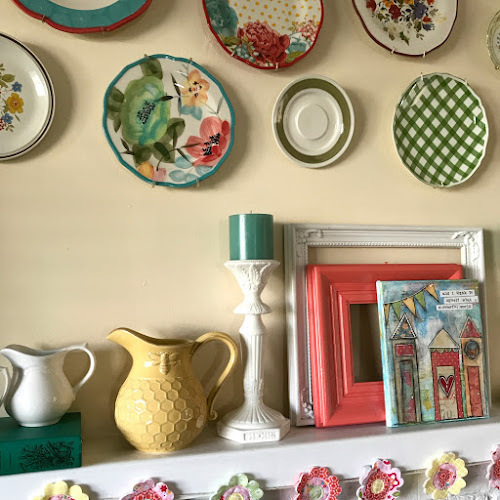 I am so in the mood to spruce up our home...although I am not as talented as you, nor do I have an eye for decorating...you have inspired me and I plan on bringing some more color and fun into our 'nest'. Everything looks just darling. Love all the fabric choices and recognize a few. Just perfect!! It is perfect. So inviting, and so very comfortable. Which is always whatniam shooting for in my home decor. I hope togetto come back one day and sit at your welcoming table for coffee or tea, and a nice chat! The rooms set a joyful and loved tone. The fabrics are great. The pops of color are terrific. Your kitchen and dining room are so sweet. It is warm and cozy for sue. I didn't see any kitchen cabinents. My dream kitchen would be furniture instead of cabinents. Beautiful pictures. Good luck with the next room. 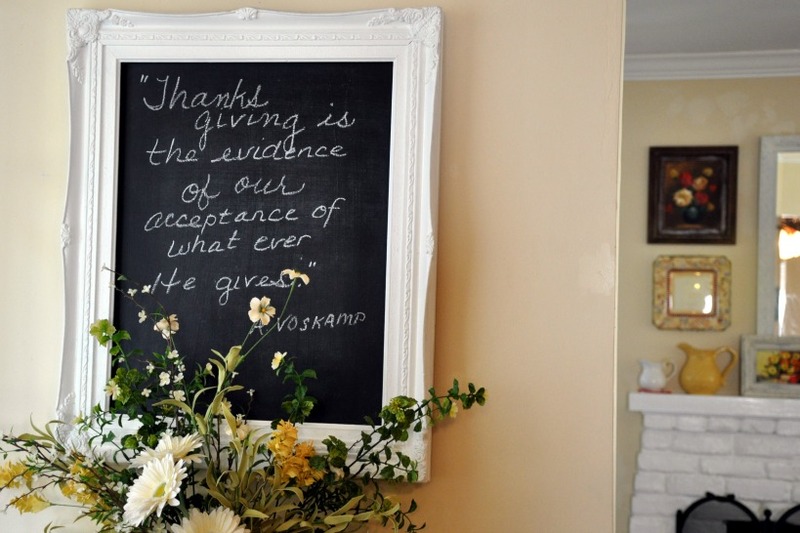 Very nice, love the chalk board A. Voskamp quote...love her!! It's absolutely lovely! Very cheery and welcoming. And it goes nicely with your happy kitchen. I can't wait to see what you do in the living room. Patty - So welcoming and cozy!! LOVE the yellow check seat cushions. 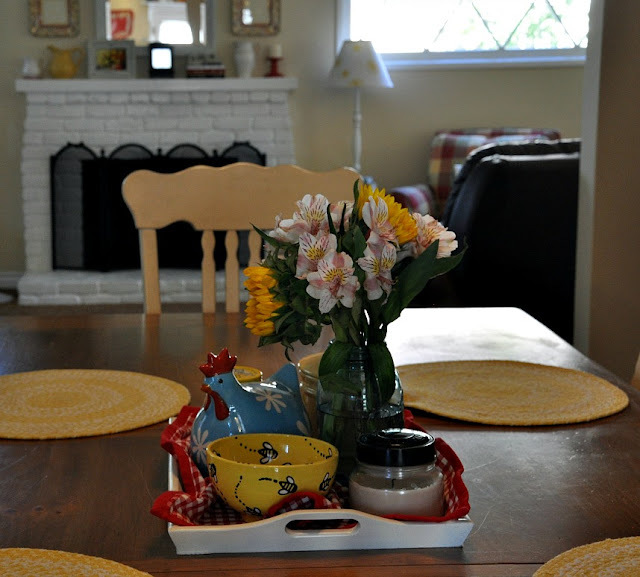 Love your dining room...it is so pretty!! 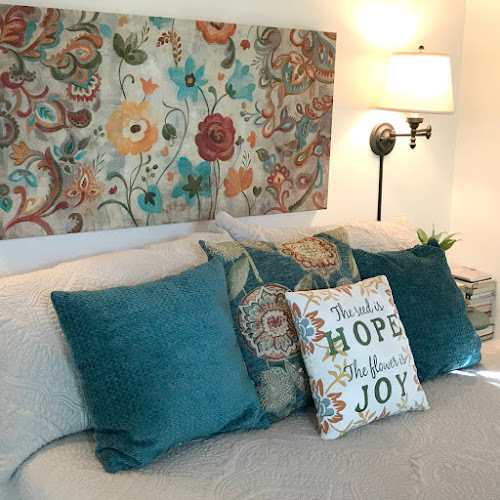 Love the colors...makes it very cheerful and a cozy happy place to be. Love how everything turned out. I just know that the living room will be just as darling as the other rooms. I love your idea of stacking place mats in the basket so that they are handy. I need to do something like that for our dining table. see why the rooms make you happy. A home should be just that - a place that makes you want to spend plenty of time in. 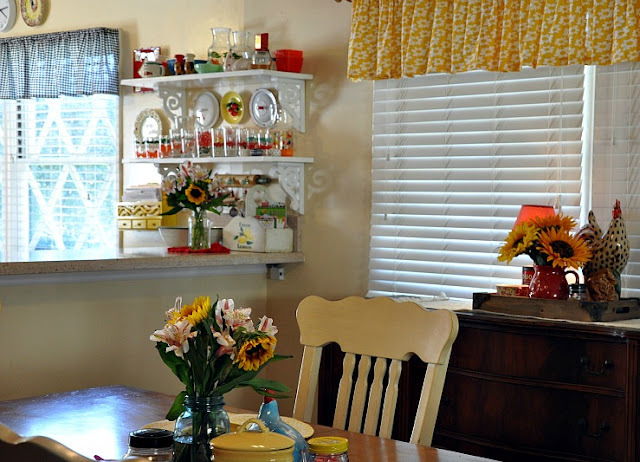 Your dining room transformation is stunning!!! I adore the homey, cozy feeling you've given to the space through the use of fabrics!!! 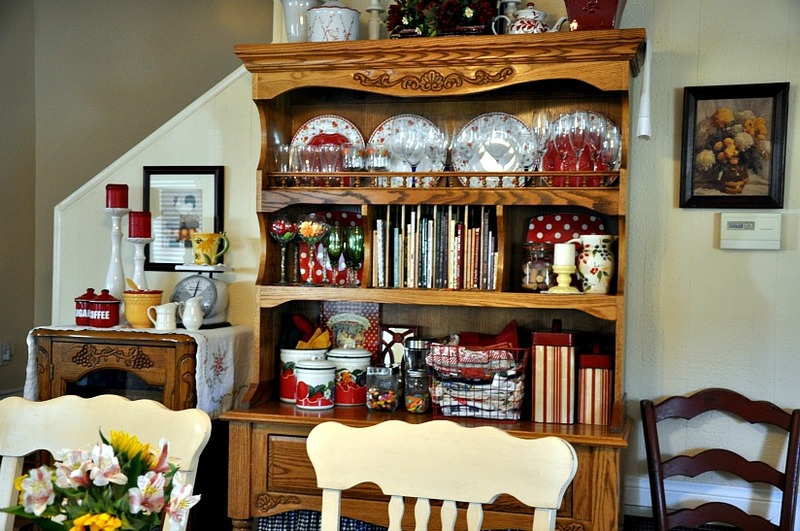 So~o~o glad you didn't paint your oak hutch...I haven't painted mine either! Tee~hee! This dining room would be a welcome place for family to have mealtime, homework, crafts...lifes happenings! PERFECT!!! How pretty you house is . Your dining room has such colorful touches and so much personality. I love the touches of red and black. 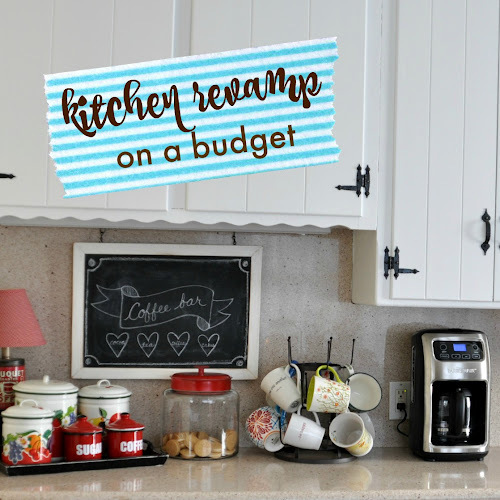 It looks great with your kitchen! It is just cute as can be, Patty! 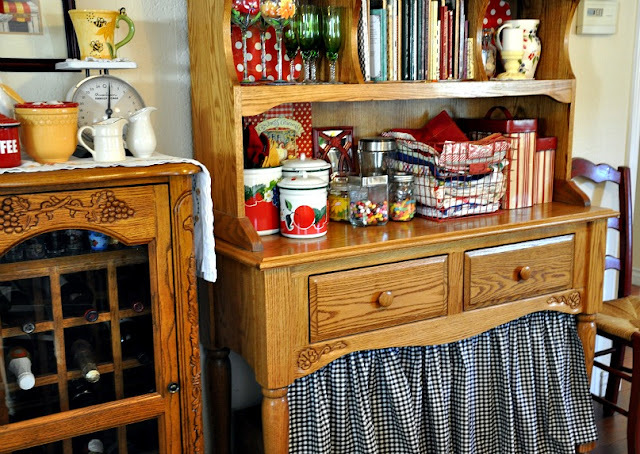 I love the gingham under the hutch! What a wonderful charming cozy place! I know you're just loving your dining room. Love your sweet yellow curtains and all that hutch! Everything is just beautiful! 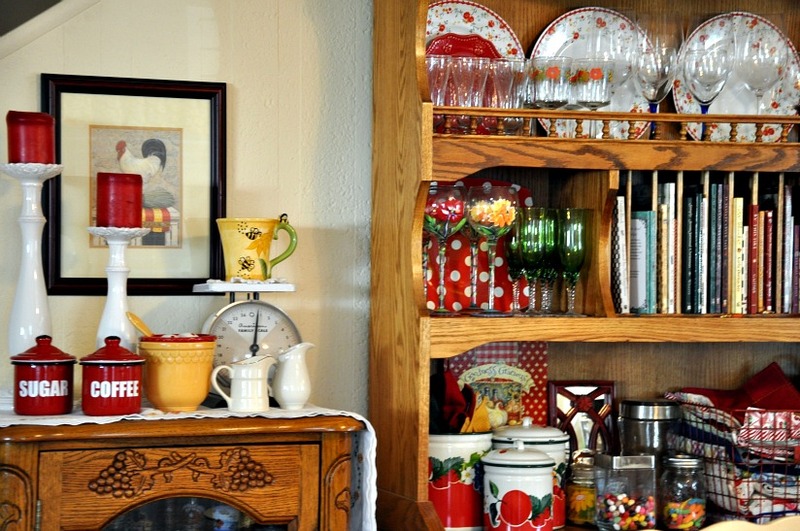 The hutch is stunning and overflowing with so many cute things! What a cozy home you have created! Pretty...pretty,,,pretty...I have those same fruit canisters! You did a great job. I'm in the middle of doing all my cleaning right now, what a job. But, I know that it will be worth it, when everything is done. 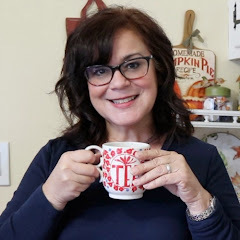 I absolutely love your kitchen and dining room! They make me happy. Thanks for sharing. These are joyfully beautiful rooms!!! I am in love with the check and the daisies!! Your home just looks like a place I would love to visit. Thank you for posting.